He was wandering outside New Orleans pizza in Clinton when pizzeria owner, Judith Damsma, saw him. He had put his boots and a pair of socks on a picnic table, and was walking around the parking lot wearing a rather worn pair of socks. “He was there quite a while and I thought maybe I’d bring out a piece of pizza for him,” remembers Judith. They had a little chat. He shared he was originally from Alberta so she asked what brought him to this area. She asked if he was staying warm. And did he have a place to stay? “Well, no one has kicked me out yet!” was his answer. With that, Damsma wished him a good day and she went back to work. He never came back to the pizza shop though she saw him now and again wandering around town. Her encounter with homelessness was brief but very relatable to rural residents across Southwestern Ontario where homelessness hasn’t always been as visible as in larger cities. There have always been the “couch surfers” and the “hidden homeless”. However, in rural towns, homelessness has become a visible issue. To some businesses, a troublesome one. Another business owner in Clinton has the kind of business where services can be accessed 24 hours and doors are open to anyone. “We’ve had homeless in before who are very neutral. They use the sink to clean up and we’ve left soap and supplies under the sink for them to use,” says a member of the family which owns the business. That changed this year when a homeless man began using the business as part of a circuit of places he would visit or sleep in. These included convenience stores, bridges, and the bushes behind the tourist centre in Clinton, says the source. The homeless man agreed but continued to curl up in the corner. Soon he was smoking and drinking in the facility and eating tins of cat food. Eventually his presence, which was both intimidating and odorous, was driving off business. Women in particular didn’t feel safe with an unkempt man making camp on the floor. “Again, I told him he could come in to warm up but we didn’t want that kind of behaviour at this business,” said the source. 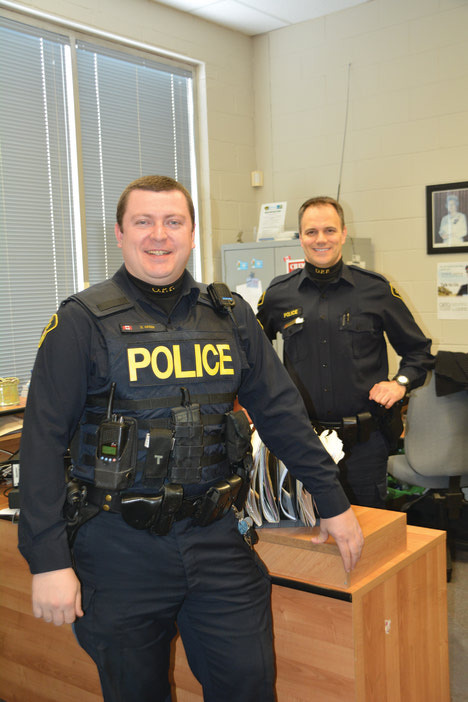 When the source realized the man wasn’t going respect her requests and that mental health was an issue in this case, she called the Ontario Provincial Police and a constable removed him from the location and relocated him to Goderich. Bring up the subject of homelessness in Huron and you’ll get a dozen stories says Constable Dave Greer, a Huron OPP officer. He recently had a call about a homeless man winter camping along the trails near Goderich, apparently with a heat source which allowed him to survive outside. Constable Greer says many homeless tend to keep to themselves and stay away from populated areas where they would draw attention. However, during the winter, they will do all they can to get out of the cold. Homelessness has a variety of underlying economic and social factors including mental health, addictions and financial crisis. Shame plays a role in the homeless situation as well, particularly in rural areas. “In rural towns, if you go to a program, you can run into someone who knows you or your family. There’s a real stigma attached,” says Martin. In cities, it’s easier to blend in and become anonymous. However, having worked with the city homeless for over 25 years, Martin says many of them are from the country. They end up in cities to find resources and many, never return home unless it’s in a body bag. With so many serious social factors, it’s impossible for service workers or police officers to have blanket solutions. The task of OPP officers, says Constable Greer, is to respond to calls and initiate charges under the Trespass Act if it comes to that. His role is more specific. As the Community Mobilization/Mental Health Coordinator for Huron, his task is to monitor all mental health calls to avert crisis. Many homeless fall into this category. Constable Greer attempts to create a relationship with the homeless to connect them to mental health and housing services that could improve their situation. The Goderich library is actually a good place for the homeless to hang out as mental health workers use the space to establish contact. However, even the most committed “wanderers” get cold. So where can the homeless go at night when businesses are closed and temperatures dip to minus 20? For many years, there wasn’t a place they could go and police would drive the men to the Men’s Mission in London. The County does not have a designated homeless shelter. Which is why a homeless shelter pilot project at Lakeside United Church was started at the impetus of Huron County council and the Goderich Ministerial. Huron Out of the Cold, as the pilot project is called, is an initiative organized by the Salvation Army, Lakeshore United and First Baptist churches in Goderich to offer food and shelter in a Sunday School classroom at Lakeside United church. 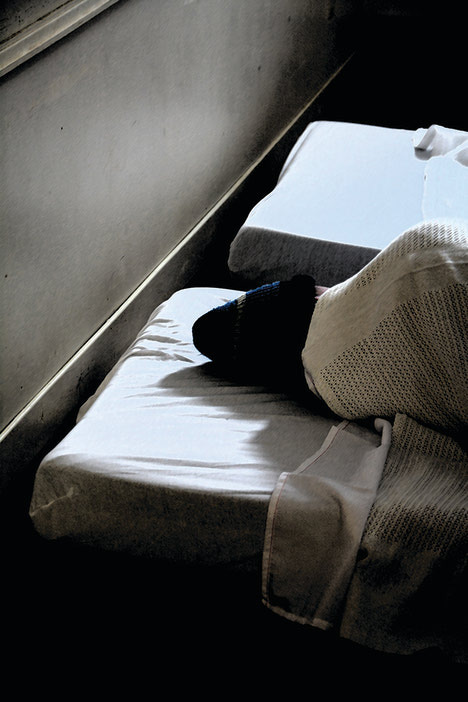 “The shelter was used most nights during the latest cold season and this winter, we have a minimum of three and as many as six to seven guests every night,” says Reverend Kate Ballagh-Steeper, the minister at Lakeside United. Lakeside is one of the largest churches in Goderich with excellent accessibility. Located close to The Square in Goderich, it was seen as an ideal location for the pilot project to serve all of Huron’s homeless. While the shelter is also open to women, women tend to access the services available at the Women’s Shelter in town. There isn’t an equivalent option for men. Huron Out of the Cold emergency overnight shelter operates seven days a week from 9:30 p.m. to 8:00 a.m. Every one who comes in gets a warm meal (something purchased and heated as the church’s kitchen is not licensed to serve homemade foods) and a mattress with clean bedding. Guests are also fed breakfast and can pack a lunch when they leave.The mattresses come from a campground and are placed on the floor, side by side, in a Sunday School classroom. Salvation Army Lieutenant David Hickman, administrator and coordinator for Huron Out of the Cold, says guests also receive shower vouchers to use at the YMCA as the church does not have shower facilities. The pilot project is proving there is a need for a emergency shelter and suggests there may be a need for a 24-hour shelter in Huron County. “As I interact with the homeless, I think they would like a space where they don’t feel like they have to move on,” says Hickman. It’s hard to know how necessary a permanent shelter would be since every homeless person’s case is different, says Ballagh-Steeper. Affordable housing is a huge issue as well. “The housing market is now out of reach for many people in a way that wasn’t true 20 years ago,” says Ballagh-Steeper. When governments close halfway houses, that also forces the less fortunate onto the streets. The crowded conditions in city shelters aren’t appealing to the homeless either. “If you are a paranoid schizophrenic, then you definitely do not want to be in a room with 50 other guys,” says Ballagh-Steeper. Smaller numbers at Out of the Cold means there is more chance for the homeless to create relationship amongst each other and with church and service leaders. Hickman says some of the men recognize they have hit rock bottom. They are seeking a better future but they face significant obstacles. Mental health in particular is difficult to overcome. Huron Out of the Cold, at the very least, can provide a warm, safe place to help get these men stabilized. The church community at Lakeside has embraced the opportunity to serve the homelesss. The County of Huron has provided enough funding to cover the costs of hiring overnight staff for the emergency shelter. Evening and overnight volunteers are required to join the paid overnight staff as one person isn’t enough to supervise. Ruth Fisher, 82, a retired teacher and committed volunteer is one of those volunteers. She admits to being surprised at the number of homeless at first. However, as she learned more, she realized just how difficult it is for some to make ends meet. Recently, she had an interesting experience when a healthy, strong man who was “well-spoken” came in for one night when he was locked out of his house. “He was very cold. I warmed up my scarf on the radiator and wrapped it around his neck. It was so stiff from the cold he could hardly move it,” recalls Fisher. They got to talking and Fisher, a former elementary school teacher in Wellington County, realized he was a former student! Ballagh-Steeper says volunteerism was a big worry going into the pilot project. Would enough people step up? The homeless shelter currently has 20-30 regular volunteers for the hospitality shift (evening) and about 20 committed to overnight. More volunteers are needed for the overnight shifts. They don’t require any more donations of clothing or health care items as Huron County residents have been very generous. Volunteers are trained how to mitigate potential issues. If things were to get out of control, the OPP station is close by. The police “know we are here” and have brought guests in. Thankfully, there hasn’t been a need to call them to defuse a dangerous situation. The homeless are not more violent than any other segment of the population, says Constable Greer. Likewise, some are adept at making the most of opportunities while others are not. “From what I have gleaned, Goderich residents tend to be very generous to the homeless they encounter,” says Ballagh-Steeper. She’s had homeless come in saying, “It’s been a good day.” Then they’ll show off free boots or talk about the number of free coffees and/or meals residents bought them during the day. There are other community members who have expressed concern that the homeless shelter is bussing homeless into Huron County. “That is not true,” says Hickman. Since Goderich is the only town in the county with an emergency shelter, homeless come in from other towns but not from outside the county. When asked what the community can do besides buy coffee for the homeless, Ballagh-Steeper suggested that awareness and action are required. “Church congregations are getting smaller and volunteers are getting older...the community needs to figure this out,” she says. If rural Ontario needs more mental health services so that the homeless with mental illness can be more stable, then communities need to bring these issues to the table at election time. Personally, she would like to see a designated homeless facility with a hybrid of emergency crash beds and transition housing complemented by intensive case management. Education is also important. Constable Stanley said the police force has been made aware of homeless issue via last year’s ‘The Push for Change’ campaign which saw Joe Roberts, former homeless youth, push a shopping cart 9,000 kilometres across Canada. The campaign focussed on homelessness among youth. Through community events such as hockey challenges, community meals, sleep-outs and clothing collection, tens of thousands of people heard about the impact of homelessness on youth, families, stakeholders and communities. Police officers have access to a calender of local services to direct homeless to. Constable Stanley also reminds community members of the Ontario 211 service. The 211 telephone helpline (2-1-1) and website provide a gateway to community, social, non-clinical health and related government services. Available 24 hours a day, seven days a week, in over 150 languages, 211 helps callers navigate the complex network of human services quickly and easily. He was wandering outside New Orleans pizza in Clinton when pizzeria owner, Judith Damsma, saw him. He had put his boots and a pair of socks on a picnic table, and was walking around the parking lot wearing a rather worn pair of socks. It was early winter.